I have a super-scientific and strategic way to handle almost every kind of wrench life chucks at me. Eye cream. Impending deadline doom? Eye cream. Insomnia? Eye cream. Zit? Eye cream. Delayed flight? Eye cream. I’m kind of kidding, but I’m also kind of not. It’s also important to note I’m a vampire who doesn’t sleep, and I have the insane dark circles to prove it. Thus, I’ve become a connoisseur of sorts when it comes to trying, scouting, and reviewing pretty much every single eye cream that’s hit shelves. I also frequently use my 71-year-old mom as a guinea pig since she’s more accustomed to treating wrinkles than I am. Given my passion for eye cream—and since the category continues to explode with new launches—I thought I’d share some of the best formulas I simply can’t live without. Sure, I own over 27 pots, pens, and rollerballs that promise transformative results, but not all of them have proven to walk the walk after talking the talk—even ones suggested to me by estheticians, dermatologists, or makeup artists. Ahead, discover 15 best eye creams I’ve personally vetted and the only formulas I actually recommend to my friends, family, and IG followers who ask for my recommendations. Keep scrolling… A twinklier gaze to help you fake a full eight hours of beauty sleep awaits. To be perfectly honest, this iridescent periwinkle eye serum from cult Australian brand CosMedix is so pretty you probably won’t even want to use it on your dark circles. That said, considering its amazing ingredient list of copper, liquid crystals, and free radical–repelling acids, you definitely should. When I need relief from the most serious dark circles, it’s this über-brightening mixture from Sunday Riley I reach for time and time again. It’s honestly like applying Facetune in real life; it relies on skin-improving ingredients like caffeine, Brazilian ginseng root extract, horse chestnut extract, acmella oleracea extract, and black cumin seed oil to get the brightening job done sooner rather than later. Even though this eye serum from Tatcha (accurately) touts a wide array of benefits like firming, hydration, and luminosity, the latter is its most exciting and notable quality (my nitpicky mom and I agree on this!). It absorbs quickly so you’re not left with a sticky or oily eye area, and the serum contains specialty under-eye antidotes like Okinawa red algae, caffeine from green tea, and a cooling ceramic applicator that help smooth bags as you apply. Believe it or not, you don’t have to spend an arm, a leg, and a fortune on a truly game-changing eye cream. The perfect antidote for puffy, sensitive, dehydrated under-eyes, I recommend this drugstore gel-cream hybrid for anyone on a budget. This little gal’s magic lies in the brand’s Toléridine patent, which discourages the unwanted production of pro-inflammatory molecules, and caffeine, which naturally decongests and de-puffs even the worst hangover aftermath. And for good measure, the blend also features hyaluronic acid and light-reflecting powers to impart hydration and shine. Out of every single eye cream I own (need I remind you that number’s roughly 27? ), this one packs the most bang for its buck simply because just the tiniest amount goes such a long way. PCA Skin is beloved by some of the best dermatologists in the business, and this product’s a top rec for those searching for an increase in hydration, firmness, and brightness. Orange stem cells, growth factors, and innovative peptides make up its hearty composition and help reduce symptoms of premature aging like parched texture, fine lines, and hyperpigmentation. The newest and perhaps most chicly packaged addition to my eye cream collection, this pretty black pot has been my answer all winter for my under-eye area’s perpetual dehydration and crepey-ness. The formula incorporates cutting-edge, targeted ingredients that are uniquely channeled through a biomimetic micro-vectorized technology to deliver tons of benefits to your skin—think an expert melding of green tea extract, pomegranate, and caffeine, in addition to Persian silk tree extract, vitamin C, and hyaluronic acid. Not to mention that de Gaspé’s entire Noir collection features It ingredients like black tea ferment and even black Tahitian pearl extracts. This is one of my favorite eye creams because not only does it boast strategic ingredients like retinol, lactic acid, antioxidants, essential oils, and algae extract, but it’s unique in that it also includes two skin-improving strains of probiotics (Tula’s signature), which encourages cell renewal while strengthening the skin’s natural hydration moisture barrier. Models (and little old me) are obsessed with this eye cream, and for good reason. It firms, lifts, and perks your under-eyes like no other. The firming-focused formula smartly contains a tri-peptide to stimulate collagen and elastin. In addition to ceramides and hyaluronic acid, it also boasts exotic albizia bark extract to detoxify, reduce puffiness, and smooth and plump any wrinkles you’re sick of staring at. For an eye cream with some bite (I mean this literally), and to zap any fine lines (no matter how miniscule) in one fell swoop, I rely on this formula from Eighth Day. It contains snake venom—dead serious—and the brand’s trademark Active Placental Matrix hones in on any unwanted puffiness, bruise-like dark circles, and fine lines. Designer peptides, vitamin C, arbutin, kojic acid, arnica montana, B vitamins, and bilberry fill out the impressive lineup of skin ingredients. 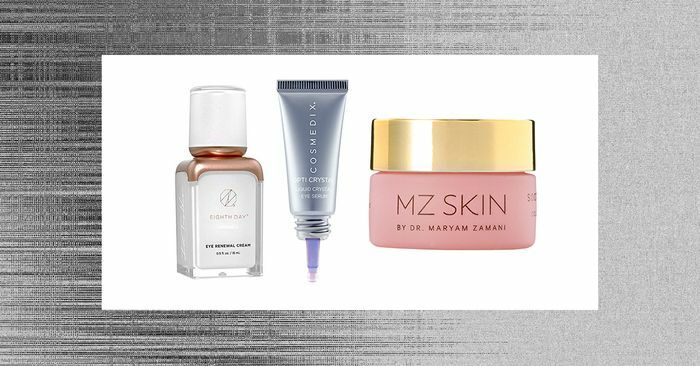 Maya Chia still manages to fly under the radar, but it just so happens to be one of the best—seriously—all-natural skincare brands you can get your hands on. This soothing and firming concoction features a dreamy mix of nutritious woodsy miracles (think macro and micro marine extracts like astaxanthin, sea fennel, sea lavender, wakame, and algae extract), in addition to potent plant oils like the brand’s signature hero ingredient, supercritical chia seed oil plus raspberry, black cumin seed oil, rooibos tea extract, pomegranate, and cranberry for good measure. Not only will this ayurveda-influenced eye cream play nicely with all skin types (yes, even the most sensitive) it also helps to firm, brighten, and de-puff. It’s ingeniously equipped with eight different peptides in addition to a variety of antioxidants, which act like your fave IG filter for your under-eyes. Even though it’s targeted as an anti-aging formula, it’s never too early for strategic preventative measures, and this luxe serum from RéVive is literally my favorite eye cream formula right now. (It’s hard to choose a favorite child, but alas, here I am.) It manages to soften fine lines and wrinkles (I foisted it on my mom to test too! ), and since it contains brightening ingredients like mica, even the scariest of circles are dramatically improved instantaneously. Tata Harper is one of my favorite skincare brands to begin with, and I frequently recommend her line to anyone looking for natural picks that are as effective as they are clean and sustainably sourced. This pretty little green tube offers up serious hydration and utilizes specific ingredients like buckwheat wax, arnica, helichrysum essential oil, Menyanthes trifoliata, and date-palm extract to zero in on issues like puffiness, sagging, wrinkles, and dullness. Okay, I 100% get this little pot of magic is a major investment. But please also bear in mind that a little goes such a long way; your cost per wear will be worth it. I promise. Not only does the formula have a magical scent I want to apply all over my body (typically not really the case with eye creams), but it’s also proved transformative on nights and mornings when my under-eyes have looked shockingly dark, sallow, and about 30 years older than the rest of my face. For this one, blame it on the brand’s epic melding of royal fern complex (1%), hyaluronic acid, chamomile extract, vitamin C from the acerola cherry, jojoba oil, macadamia nut oil, mineral oxides, and beeswax. iS Clinical is the go-to skincare brand of Hollywood, and this youth-enhancing eye elixir is one of the best players on its A+ roster. Thanks to the brand’s commitment to using the highest-grade ingredients and most forward-thinking technology, you’ll reap benefits both instantly and long-term, and your delicate eye area will be supercharged with antioxidants, vitamins, copper tri-peptides (for a surge of collagen! ), and hyaluronic acid for maximum moisturization. Next up, 18 beauty enhancing essentials that weirdly enhance my outfit. Kenya terror attack: What happened during the Nairobi hotel siege? BBC – Future – Can detoxing help your gut health? January 31, 2019 Comments Off on BBC – Future – Can detoxing help your gut health?